Excavations at two quarries in Wales, known to be the source of the Stonehenge ‘bluestones’, provide new evidence of megalith quarrying 5,000 years ago, according to a new UCL-led study. The findings were published in the journal Antiquity. It was Herbert Henry Thomas, a British geologist, who first declared that the “foreign stones” of Stonehenge—those that did not come from the vicinity of the prehistoric monument and whose raison d’être was therefore most shrouded in mystery—had been hewed from rocky outcrops in west Wales. In 1923 he pointed to the Preseli Hills of Pembrokeshire. Nearly a century later he has been found to be nearly, but not quite, right. The new discoveries also cast doubt on a popular theory that the bluestones were transported by sea to Stonehenge. Was Stonehenge built by seafarers? Prehistoric sailors may have been responsible for many of the megalithic monuments. Stonehenge is one of many megalithic monuments from prehistory dotted around Europe and scientists have now discovered the art form of giant rocks was a popular trend that started 6,500 years ago in France. The knowledge and expertise to create these monuments was then spread around Europe by sailors over the following millennia. Similar monuments to the original appeared in coastal regions around the Mediterranean and Atlantic coasts via sailors on large ships using emerging sea routes. The study, published in the journal Proceedings of the National Academy of Sciences, theorizes that these megalith structures have been around for nearly 7,000 years and may have originated in northwestern France. Stonehenge Opening Times and Entrance Prices. English Heritage advise to expect a visit to last around two hours. Please see the table below for opening times for 2019, with some seasonal variability, and entrance prices for adults, children, families, seniors and groups. The English Heritage Visitor Centre at Stonehenge is located 2 kilometers from the monument. This is your entry point to Stonehenge and the place where you pick up your tickets, souvenir guides and optional audio guides. The new Visitor Centre also offers a modern exhibition with prehistoric objects on display, and a spacious café and gift shop. A Stonehenge shuttle transports you between the Visitor Centre and Stonehenge (included in your ticket price). If you come by car you will park in the car park outside the visitor centre. It is free for people purchasing tickets to enter Stonehenge, there is a charge if you are not. Tour buses have their own separate coach park. All Members of English Heritage or National Trust must show a valid membership card on arrival to be granted free parking and site access. To enter the Stonehenge Exhibition at the Visitor Centre you need a full ticket to Stonehenge, anyone can access the café, gift shop and toilets though, for free. Tickets to Stonehenge are booked by half hour time slot, the website showing you how many tickets are still available for your chosen date and time. Note: you cannot reserve tickets on-line on the day of your visit, you must reserve before midnight latest on the day before. Only a very small number of tickets are held back each day for walk-up visitors. Was it a Neolithic calendar? A solar temple? A lunar observatory? A calculating device forpredicting eclipses? Or perhaps a combination of more than one of these? In recent years Stonehenge has become the very icon of ancient astronomy, featuring in nearly every discussion on the subject. And yet there are those who persist in believing that it actually had little or no connection with astronomy at all. in the 17th century, there has been endless speculation about its likely purpose and meaning, and a recurring theme has been its possible connections with astronomy and the skies. Stonehenge and other stone monuments were probably used for special moonlit ceremonies. 5000 people came to celebrate the winter solstice at Stonehenge this year. The winter solstice occurs each year when the North Pole is tilted farthest away from the sun, resulting in the fewest hours of sunlight, and the shortest day of the year. Crowds of people played music and danced at Stonehenge in Wiltshire, where monuments are believed to be aligned to the movements of the sun. The traditional event attracted hundreds of people to the monument, particularly from the Pagan community. Kate Davies, of English Heritage, said: “It was fantastic to welcome approximately 5000 people to Stonehenge this morning to celebrate winter solstice. Revellers in vibrant costumes gathered to mark the Winter Solstice and to witness the sunrise after the longest night of the year. Striking photographs show choirs singing, a couple embracing, and many taking a moment of peace by the ancient stones. Stonehenge has been a place of worship and celebration at the time of Winter Solstice for thousands of years. English Heritage has “managed open access”, meaning the public can stand among the stones on these days. Anyone can turn up on the day to get close to the stones, but people are asked not to touch or climb on them. 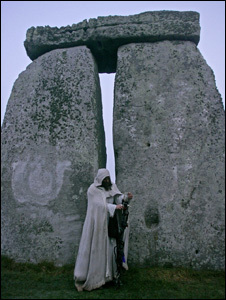 Follow us on Twitter and Facebook for all the latest Stonehenge news and Winter Solstice updates. Did Neolithic cows moooove Stonehenge’s bluestones? The mystery of how Stonehenge’s bluestones were transported 160 miles from Wales to Wiltshire has puzzled archaeologists for generations. Some experts say glaciers picked up and deposited the huge rocks in the last ice age, while others have suggested the stones were dragged on rollers or sleds by manpower. Stonehenge may have been built with the assistance of cows who helped carry the enormous rocks across the British Isles. It could help explain how the fabled bluestones managed to complete the journey from Wales to Wiltshire, where Stonehenge still sits today. Previous research has claimed the movement of glaciers deposited the huge slabs of rock 160 miles away from their original location. New research has found evidence of cattle being used by humans to pull and carry heavy loads for 8,000 years. Archaeologists at University College London discovered that the bones in the feet of Neolithic cattle demonstrated distinctive wear patterns, indicative of exploitation as ‘animal engines’. Access to Stonehenge for Winter Solstice is free and is subject to the Conditions of Entry. Please read these before deciding whether to attend. Stonehenge is in a field on Salisbury Plain and the weather in December will be cold and wet. Even if it isn’t raining, the ground will be wet from the dew and there may also be frost. Sensible footwear and warm, waterproof clothing is essential. Please note, parking charges apply. Stonehenge is an ancient prehistoric site which has been a place of worship and celebration at the time of Winter Solstice for thousands of years and is seen by many as a sacred site. English Heritage is pleased to provide free Managed Open Access to Stonehenge for Winter Solstice and ask that if you are planning to join us for this peaceful and special occasion that you read these Conditions of Entry and the information provided on the following pages before deciding whether to come. Admission to the Winter Solstice at Stonehenge is free of charge. Please help us to create a peaceful occasion by taking personal responsibility and following the Conditions of Entry and guidelines. We have a duty of care to ensure public safety and are responsible for the protection of Stonehenge and its surrounding Monuments. If we are to ensure that future access is sustainable, it is essential that everyone observes and abides by these Conditions of Entry. Amplified Music is inappropriate and will not be permitted. To help us reduce the amount of litter on site, leafleting or flyering is not allowed. Do not bring drones or any type of remote-controlled aircraft to Stonehenge. There is a No Fly Zone in place over Stonehenge during Winter Solstice which makes it a criminal offense to attempt to fly anything over the stones below a certain height. The No Fly Zone includes drones. If you attempt to fly a drone from anywhere on site, including the Solstice Car Park, you will be stopped and asked to leave. For further information about Managed Open Access for Winter Solstice at Stonehenge, please call English Heritage Customer Services Solstice Hotline on 0370 333 1181. Parking for Winter Solstice is very limited and we cannot guarantee that there will be space in the two Winter Solstice car parks. We strongly recommend car sharing or using public transport. Car Sharing – Cut the cost of your journey and parking using the Stonehenge Solstice Car Sharing Community to offer space in your car or to request a space. Travel by Bus – Salisbury Reds buses will be running from 6am from Salisbury via Amesbury. Organised Tours – If you are considering visiting Stonehenge for the Solstice celebrations you can join an organised tour. Use a reputable tour operator who respect the conditions. Stonehenge Guided Tours are the longest established company and offer guided tours and transport from London. Solstice Events offer small group Winter Solstice Tours from Bath using local expert guides. Limited parking is available in the Winter Solstice car parks, which will open at 6am on the 22 December. Signs will direct you to the Solstice car parks – please ensure that you follow these. If directed to parking away from the Stonehenge Visitor Centre, motorists will have access to Park & Ride transport to the Visitor Centre included in their parking charge. We cannot guarantee entry to the car parks and recommend car sharing or coming by public transport as cars will be turned away when the car parks are full. Last year this happened at around 7am. Please do not arrive early as there is no waiting on the roads in the area and you will be moved on. £250 – Commercial coaches (17 seats and over). Commercial vehicles must pre-book via BookStonehenge@english-heritage.org.uk and terms and conditions apply. The parking charge helps the charity cover the costs of providing additional staffing and lighting in the car parks and is designed to encourage people to car share or travel by bus. Parking for Blue Badge holders is available at the Stonehenge Visitor Centre Car Park. No pre-booking is required. Visitors are asked to highlight their Blue Badge to stewards on arrival so that they can be directed to an appropriate parking space. A shuttle will run from the Visitor Centre to the Monument and visitors with accessibility requirements will have priority. Stonehenge is in a field on Salisbury Plain and the weather in December will be cold and wet. Even if it isn’t raining, the ground will be wet from the dew. There may also be frost. Sensible footwear and warm, waterproof clothing is essential. There is at least a 30 minute walk in low light or darkness, from the Visitor Centre to Stonehenge itself. You are strongly advised to wear strong, waterproof footwear, and to bring a torch with you. A shuttle will run from the Visitor Centre to the Monument and visitors with accessibility requirements will hve priority. All other visitors should be prepared to walk. There are no catering facilities in the monument field; however the café at the visitor centre will be open for hot drinks and breakfast rolls from 6am. Solstice at Stonehenge. From Past to Present.